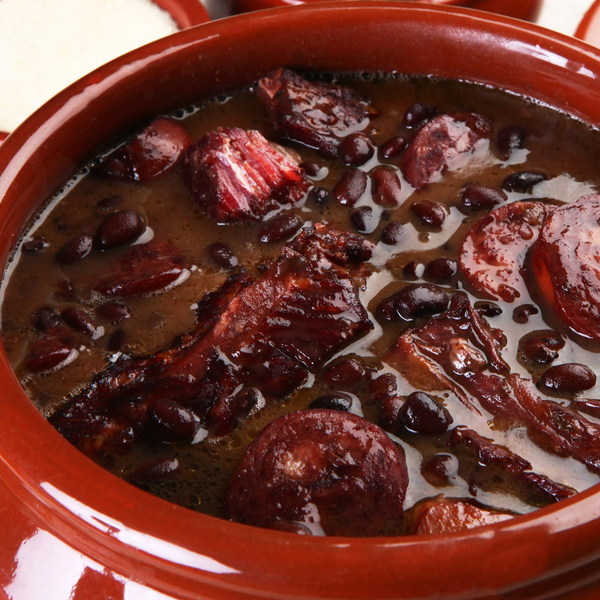 Feijoada is a stew of black beans with deep rich flavors of salty beef and smoked pork. In many homes across the country, saturdays are known as the day of feijoada, that's how entrenched it is in the culture. The stew is served with steamed white rice. Add oil to a a large heavy saucepan over medium heat. Add the onions and garlic when the hot oil. Season with pepper and saute for 5 minutes. Add the sausage and beef and cook for 5 minutes, turning ocassionally. Add the ribs, beans, bay leaves and water and bring to a boil, then reduce the heat to medium low and simmer until the beans are tender (about 2 1/2 hours). Add salt and pepper to taste.